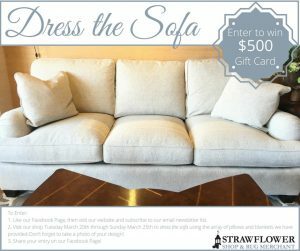 Visit our shop Tuesday March 20th through Sunday March 25th to Dress the Sofa for a chance to win a $500 Gift Card to the Strawflower Shop & Rug Merchant! Voting will begin Tuesday March 27th through Saturday March 31st. The winner will be announced on Tuesday April 23rd. 1. Like our Facebook Page, then visit our website and subscribe to our email newsletter list. 2. Visit our shop Tuesday March 20th through Sunday March 25th to dress the sofa using the array of pillows and blankets we have provided-Don’t forget to take a photo of your design! 3. Share your entry on our Facebook Page!